Final stats: 946 yds/~8 oz, around sportweight. Is there any way that could match her eyes better? I split each 4 oz piece of top into three pieces, then stripped those down to 4 pieces each. I threw it all in a bowl bag (the Wee Ridiculous Dog LOVES fiber, and I had several heartbreaking instances of finding him on the floor gnawing on a large hunk of Targhee - wretched creature!) 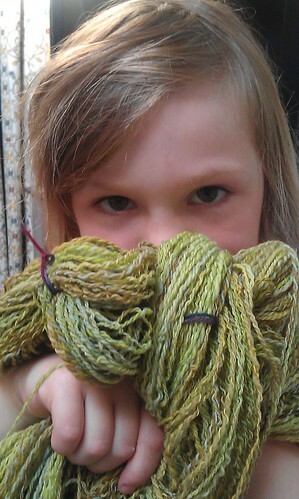 and spun the sections at random using a short forward (worsted) draw. I was hoping to finish all the singles before RAB, but such was not to be. 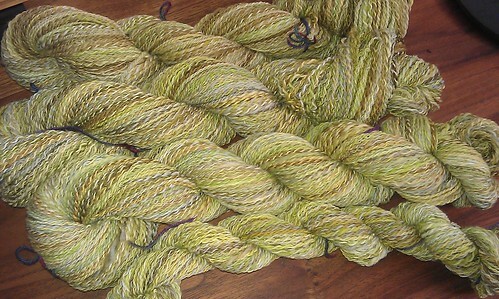 The day we got back from Cornwall, I started back in, and managed to finish up the plying by this past weekend. I tried to ply a little more loosely then I usually do, hoping for a less dense finished yarn. It seems to have worked out - almost a thousand yards from half a pound is pretty good! I think Dev is pretty pleased with the result. 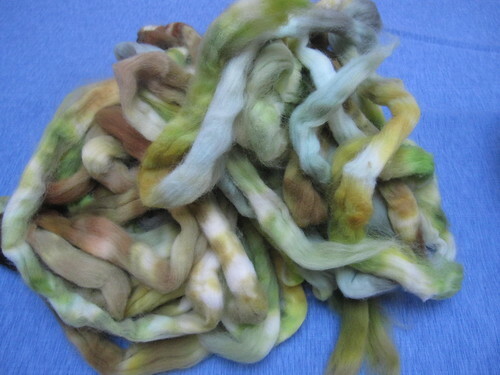 She wants a simple crewneck cardigan out of this stuff, which I think will be gorgeous. Although the prospect of a sportweight cardigan for a 6 year old who will grow out of it nano-seconds after it is finished is a bit daunting. Thankfully Boo's eyes seem to be tending towards a similar color, so maybe she'll get some use out of it as well! This is my pile for the TdF (detailed notes on the Flickr page). It works out to 2.75 lbs total, which is just over last year's total (39 oz vs 44 oz). That is, provided this plan doesn't get completely thrown out the window because of a super secret handspun project(TM) that may be in the works. We'll see...but a weekend with Wimbledon and Le Tour? Bliss! 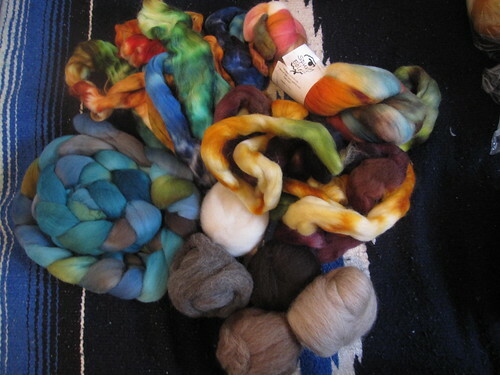 Written by porpoise On July 1, 2011 In "Tour de Fleece", "spinning"